Overall Summary: This bout had a lot of toe-to-toe action and inside fighting. Both fighters landed hard body shots. As the rounds passed, Rosas kept up his pace, but Martinez started to slow a bit. Rosas' body punching was having an effect on Martinez. Martinez had the reach advantage, but chose to fight mostly on the inside and that played into the game plan of Rosas. Martinez was very resilient in the exchanges and landed some quality punches, but failed to establish the jab. This led Martinez into a fierce battle with a solid veteran. Get yourself a new punching bag and save with $2.95 shipping. 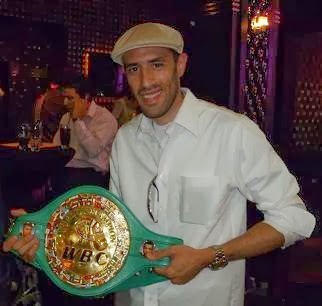 Rosas was the more experienced fighter and appeared to be Martinez's toughest competition to date. Alberto Rosas improves his record to 30-5, 25 KO's and Alejandro Martinez falls to 16-2-1, 11 KO's.